In a record-setting display of accelerated construction, traffic began rolling over the reconstructed Interstate 40 bridge in eastern Oklahoma on July 29, just slightly more than 2 months after the bridge's collapse. Fourteen people were killed on May 26, 2002, when a barge slammed into the bridge on Interstate 40 over the Arkansas River near Webbers Falls, Oklahoma. The impact caused four of the bridge's approach spans to collapse. In addition to the tragic loss of life, the dramatic bridge collapse deprived the State of perhaps its most important east-west transportation link, costing millions in lost time and commercial revenue. "Everyone connected with this project has given a maximum effort from the beginning. I'm tremendously proud of the way our ODOT people responded to this crisis and the long, hard hours they worked. The many organizations we have partnered with on this project have also given the utmost in work and cooperation," said Oklahoma Department of Transportation (ODOT) Director Gary Ridley at the reopening ceremony. "Our contractor, Gilbert Central, did an incredible job of organizing and carrying out a project that would normally take twice as long. With a major coast-to-coast traffic artery interrupted by the bridge disaster, rapid reconstruction was imperative, and all parties came through brilliantly." "The quick response of the Oklahoma Department of Transportation, the Federal Highway Administration (FHWA), and private sector contractors combined with the innovative approaches provided for in the contracting and construction process serve as an example of how our country responds to meet challenges," said Federal Highway Administrator Mary Peters at the reopening. 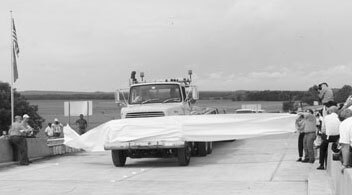 The first vehicle breaks the ribbon at the I-40 reopening on July 29. Traffic flows eastbound across the reconstructed bridge. A view of the work site from down river. A little more than a week after the disaster, ODOT held a pre-bid meeting at the bridge site so contractors could see the extent of the damage. This was the first time ODOT had arranged a pre-bid meeting for potential bidders without having a complete set of construction plans. On June 12, a special session of the Oklahoma Transportation Commission awarded the primary contract for the rebuilding to Gilbert Central Corporation. By this point, demolition and removal of the fallen section had been completed and reconstruction was ready to begin. The consultant that designed the reconstruction plans had been given 16 days to have biddable plans ready, with the contract providing an incentive of $5,000 for every day it beat the 16-day schedule and a disincentive fee of $2,400 for every day over 16. The plans were completed in 12 days, which was a tremendous time saver for the project. Innovative contracting measures that ODOT used to speed up the project include A+B bidding, which the department has used for major projects for the past several years. With A+B bidding, contractors bid on both the work itself (A) and how soon they believe they can complete the work (B). ODOT also mandated large incentives and disincentives as part of the contract. Gilbert Central would receive $6,000 for every hour it beat the contract schedule or lose $6,000 for every hour it exceeded it. No cap was placed on the number of hours either way, but if the contractor took even a few days more than allowed to complete the project, it would cost the company close to half a million dollars. Gilbert Central built the bridge primarily out of concrete, which was easier than steel to bring into the area and could be poured on site. The new structure has concrete girders, with the exception of one span that is tied into the existing bridge. The contractor employed a technology that utilized computer chips to measure the temperature and strength of the concrete to keep engineers informed of any irregularities that occurred during the construction process. 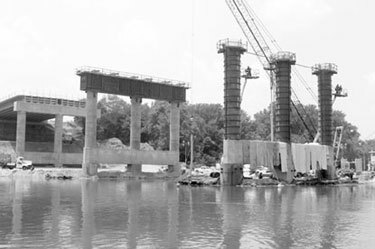 Other innovations used included precast concrete and heat-straightening to repair damaged steel girders. In this repair process, a limited amount of heat is applied in specific patterns to the deformed regions of damaged steel in repetitive heating and cooling cycles to produce a gradual straightening of the material. 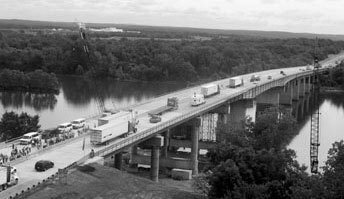 Coordination among Federal, State, and Tribal governments was crucial to putting the bridge's rebuilding on the fast track. The Cherokee Nation, which controls the land around the site, facilitated the project by making work areas easily accessible to contractors. FHWA approved $3 million in Federal emergency relief funds to get work started immediately. In addition, FHWA's Okahoma Division office provided technical expertise and assistance throughout the rebuilding process, particularly in the area of contract administration. FHWA worked with ODOT to streamline the review and approval procedures to get a reconstruction contract ready to put up for bid. ODOT also received technical support and cooperation from the U.S. Army Corps of Engineers, U.S. Coast Guard, and the California Department of Transportation. About $15 million was spent on demolition, clean-up, and repair of the bridge. But the amount of money spent on repairs to the bridge was far less than what it would have cost to keep the bridge closed: ODOT traffic engineers estimated that the total user cost was $430,000 per day for every day that the bridge was not open. For accelerating the construction and beating the deadline set in the construction contract by 10 days, Gilbert Central earned $1.5 million in incentive funds. ODOT also spent $12 million on asphalt resurfacing and other upgrades and maintenance to the highways used as a detour around the site. An average of 4,395 trucks and 12,546 other vehicles used the detours every day. The $12 million cost also included safety improvements to railroad crossings on the detour routes, such as adding crossing gates, additional signage, rumble strips, and striping. An average of 18 trains crossed the detour highways daily. For more information on the Oklahoma I-40 bridge project, contact the ODOT Public Affairs Office at 405-521-6000 or Lubin Quinones at FHWA's Oklahoma Division Office, 405-605-6011 (email: lubin.quinones@fhwa.dot.gov). You can also visit ODOT's Web site at www.okladot.state.ok.us/public-info/i40-bridge.htm.